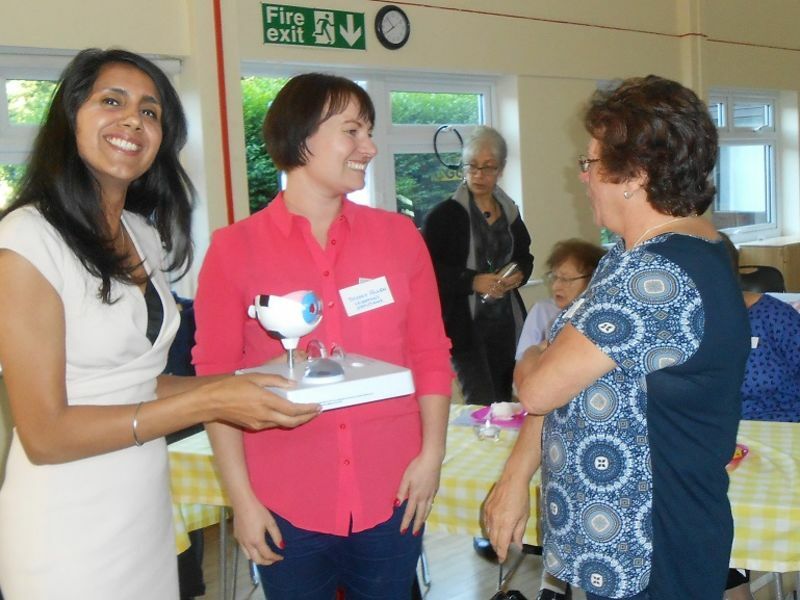 On 20th June, Leightons optometrists Suki Bains and Bryony Allen, along with Camberley branch manager Priya Burgul, visited the Camberley Alzheimer’s Café to give a short presentation on dementia and the eye. The presentation by the Leightons team was part of a larger event entitled “Who can I turn to for help?”, with speakers from Surrey Heath, a nursing home and even the fire service also in attendance. Eye movements become less well-controlled. This increases fatigue when reading, where stable, accurate eye movements are essential. Peripheral lower fields of vision may become restricted, increasing the risk of falls. Colour vision is may become reduced, so using colour to direct should be avoided. Low vision contrast reduces, so keep contrasts high and increase lighting to artificially increase contrast. For example, serve dinner on a plain white plate so the food can be easily seen. In later stages, visual hallucination is common. It cannot be prevented because it is due to the brain misinterpreting vision, but patterns on curtains and carpets or passing shadows on the wall can exacerbate the problem. The Leightons presentation was very well-received by attendees of the Alzheimer’s Café event. Several audience members commented afterwards on what a comprehensive session it was given the 10 minute time slot, and were surprised at, yet appreciative of, the new knowledge they gained. Suki, Bryony and Priya helped to raise awareness of eye and vision problems connected with dementia that have not previously had a particularly high profile with the public. The evening was a fantastic opportunity to showcase Leightons’ expertise within Camberley’s local community and to highlight the support that Leightons can offer to people with concerns about their general eye health. For more information about Leightons Camberley, visit their branch page here. If you would like to book an eye examination or a free hearing assessment with your local Leightons Opticians and Hearing Care branch, call us on 0800 40 20 20, or alternatively you can book an appointment online.